how do i love thee…Quade’s faves from coast to coast! well it is that time of the year again… valentine’s day! this year I will be making a cameo appearance at Juniper Flowers in Seattle so I thought I would share a few of my favorite places from coast to coast … a sort of valentine’s play book for those of you who still need to order something special for your sweetheart. Salem, MA is my lovely little seaside stop when back home and I never miss a visit to fiddlehead. Tucked on a side street this gem of a shop is an oasis, walking in there takes you away from the hustle and bustle creating an urban oasis named after one of my favorite organic elements to use in florals. Boston, MA has so many great spots… I would be remiss to not mention Louis Barry, it is where my own floral career began afterall. If your sweetheart works in the financial district or the Prudential tower this is the place to call! Brooklyn Baby! For many years I schlepped florals around town for Valentine’s Day… I’ve hung up hat & retired from the day to day floral madness that Valentine’s Day brings but I can certainly let you know where I would be hoping to be receiving a bouquet from… Seaport Flowers! Amy and the team over at Seaport Flowers is stellar! Give them a ring or better yet take a spin by this Brooklyn Heights shop to take a peek at their home collection and in the spring their outdoor garden space is bursting with great finds! Amy has such a great eye and sense of style! Winston Salem, NC When in NC I make a stop at Price Davis. I’ve been a fan of this shop for many years and it has been my go-to when I want to send a bouquet to family and friends who live in Winston Salem. 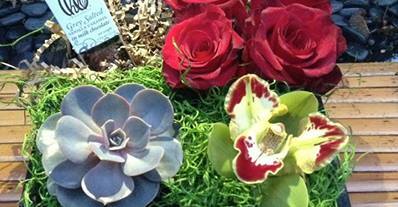 In addition to fresh floral they usually have gorgeous Phaeleonopsis Orchid plants on hand… one of Mama Quade’s faves! Beverly Hills, CA A fellow floral alum from beantown went west and is now the lead designer at Flowers by Michael in Beverly Hills, CA. Her creative arrangements are gorgeous and the Valentine’s collection was inspired by Starlets & Leading men of the Silver Screen…. these bouquets are fit for the starlet or leading man in your life for sure! Seattle, WA Jean Louise at Juniper Flowers has taken the Pacific Northwest by storm. Using her background as an artist Jean Louise designs florals that are individual works of art…color, texture, and beauty abound! We first met at Massachusettes College of Art and started our floral careers together in Boston. I will be joining her at Juniper making a cameo appearance in her Seattle studio for Valentine’s Day this year and I am thrilled to collaborate on some designs with her! These are my faves… what are yours? I would love to hear what flower/garden shops inspire you! & get to it… place your orders folks, valentine’s day is FRIDAY! Minimum Order – most shops have a set minimum order amount, this may be higher during a holiday to cover additional labor and increased product costs. sales tax and delivery are usually additional. Card Message – short and sweet is the way to go here… there generally isn’t a lot of room on those enclosure cards. Delivery – this is the hardest part of the job on valentine’s day… cold, inclement weather & traffic conditions are a few of the challenges your floral will face before arriving at it’s destination. although a tip is not expected it is generally much appreciated! Thank You! – did you receive a beautiful bouquet? someone took the time to think about ordering flowers, crafting the message & plunked down some greenbacks to get the ball rolling before a designer put together your floral and someone delivered it. call up that nice person who sent you that lovely bouquet and thank them! xokQ. bento box from Juniper Flowers.